The new minimax s 41es and s 52es thicknessing planer with 520 mm working width, professional, massive and compact, for a high-flexible production; ideal for the demanding craftsman and carpentry. An optimal planing with minimal effort, thanks to the 95 mm diameter cutter block and 4 knives. For an impeccable finish the pressure of the thicknesser feed rollers can be adjusted according to the type of wood machined. The roller in-feed has a helicoidal profile to guarantee firm and constant work piece feed, while the out-feed roller in sandblasted steel maintains the perfect post-processing finishing. For a maximum long lasting stability the cast iron thicknessing table lifts on 4 spindles with trapezoidal threads dust protected. The 3 spiralknives give an exceptional finish. Reduced noise during machining provides a more comfortable working environment. It also improves the dust extraction due to the production of very small chips. 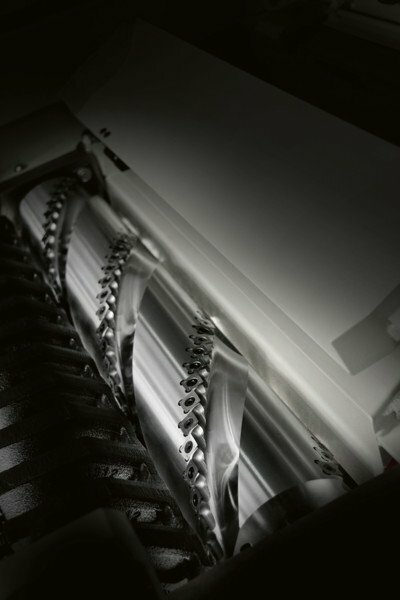 Each cutter has 4 tips which can be rotated into the cutting position when worn. Therefore increasing the production life of the cutter block before knives require replacement.